Details (including a checklist) for the first Calbee set of the year were announced this past week. There will be 84 "regular" player cards (7 per team) in the First Series, along with a whopping five subsets. The subsets are all four or less cards but still - five subsets! 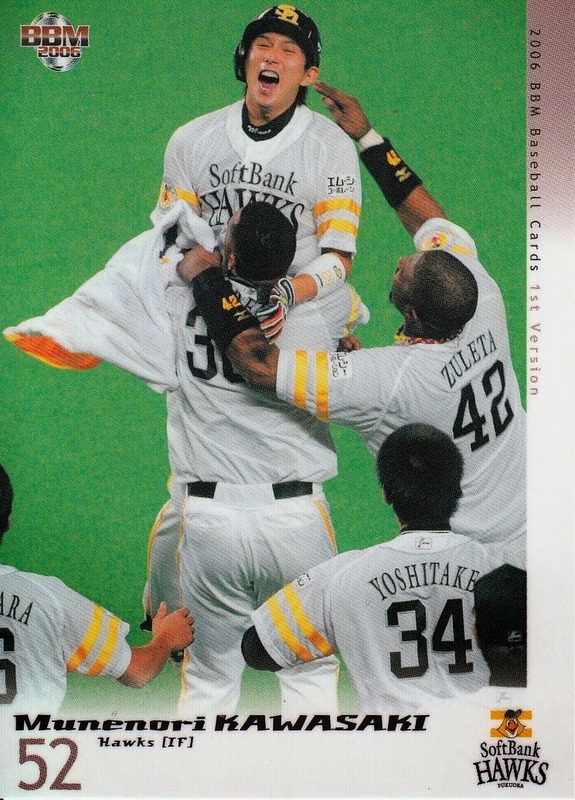 Calbee appears to be attempting to make up for BBM's slack in not commemorating the Eagles championship - there's two cards for the League Champions (the Eagles and the Giants), four cards for the Climax Series and three cards for the Series itself. 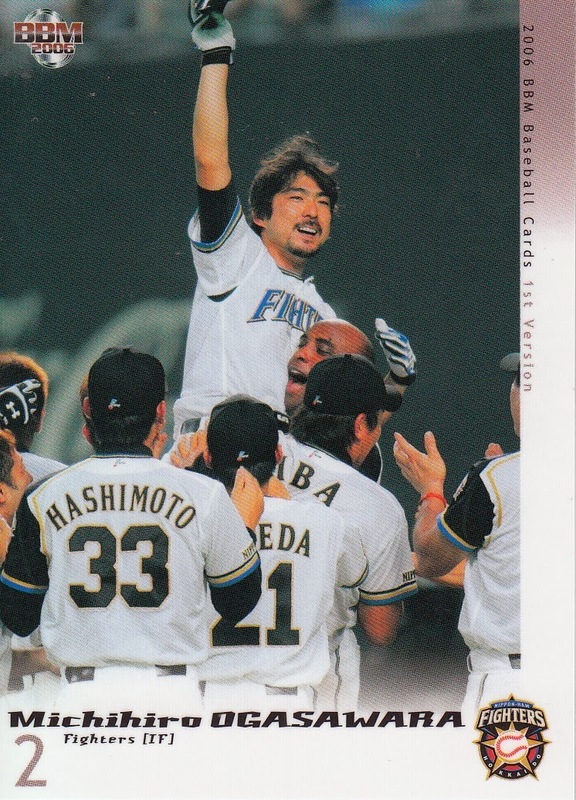 There's also a three card subset for "Legend Retirement Players" Tomonori Maeda, Shinya Miyamoto and Shinjiro Hiyama - I don't know if these will feature reprints of their earlier Calbee cards although historically they have not. 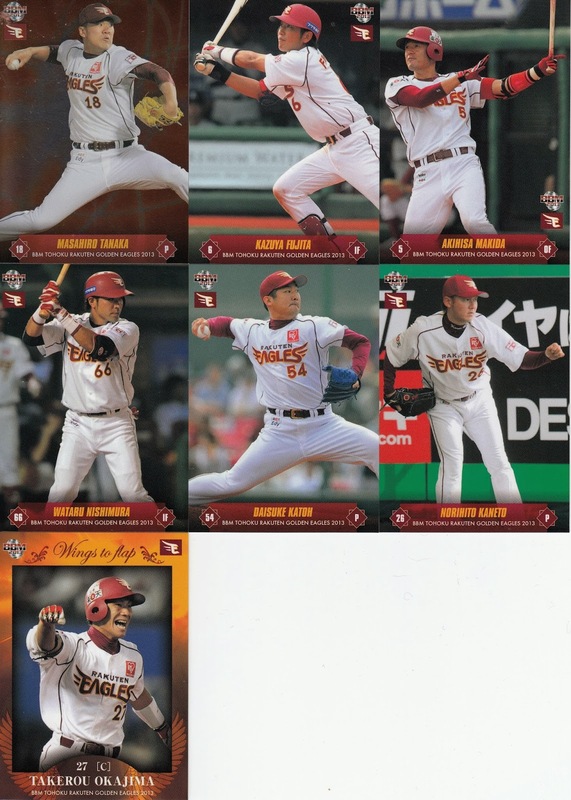 There is also the ubiquitous four checklist cards - this year it appears that Calbee has resumed featuring highlights on these as Wladimir Balentein, Shohei Ohtani and Norihiro Nakaura are all included. 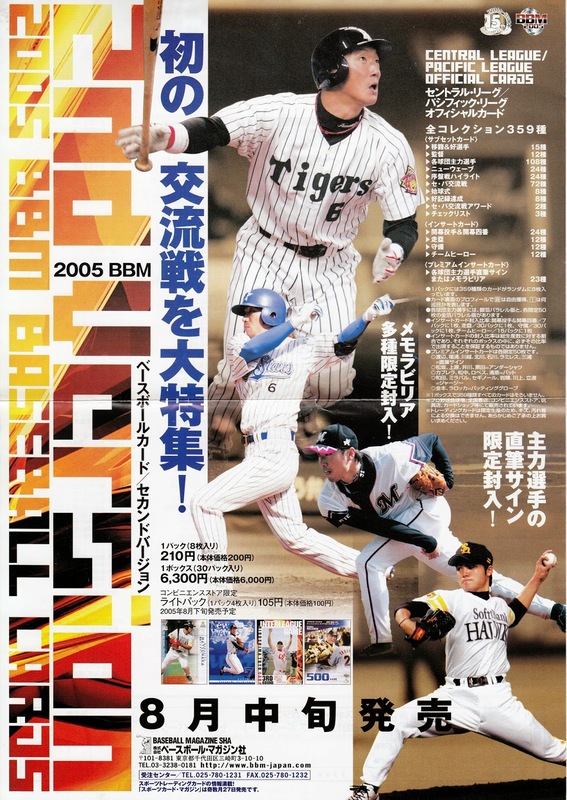 It also looks like Calbee has addressed one of my complaints from last year and is featuring players who switched teams in the off season (Hirokazu Ibata for one) and rookies (Yuki Matsui) in the set. As usual, there's a 24 card "Star" insert set featuring two players per team. There is also a "Title Holders" box set that is being made available as some sort of online purchase. Oddly enough, this subset includes Masahiro Tanaka who obviously will not play in Japan in 2014 but not Estaban German, who will. 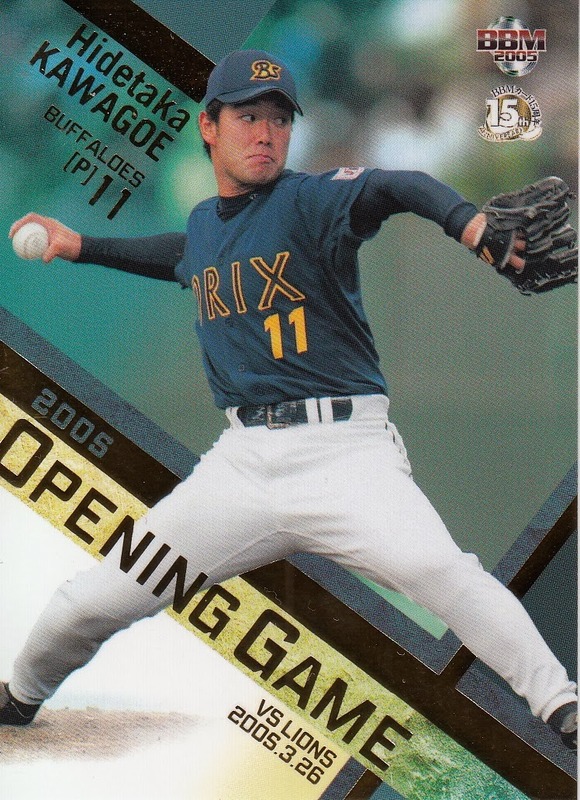 German lead the Pacific League in OBP in 2013 while playing for the Lions but joined Orix in the off season and apparently Calbee did not get a picture of him with his new team in time. 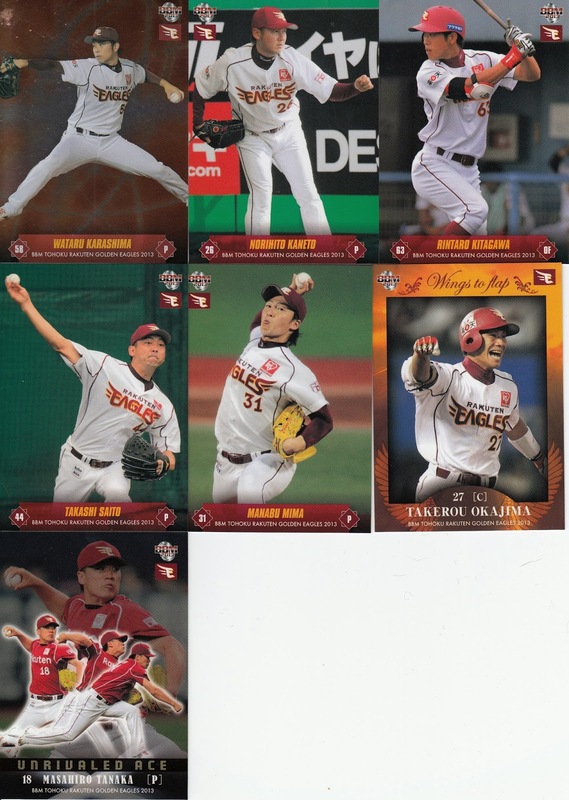 There are also two special "lucky" card winners that (I think) feature last year's Rookie Of The Year winners - Takahiro Norimoto and Yasuhiro Ogawa (who both appear in the Title Holder box set as well). Not sure how you win one of them. According to Niki's page about the set it will be released March 24th. Got a couple more BBM team packs from the Ebay seller that I had bought the other packs from. This time they were Eagles team packs. He had originally been selling these at $5 a pack but he dropped it to $4 after a few weeks. Since that was roughly the face value of the packs and I was buying something else from him anyway, I decided to pick up two of them. I'm not a big fan of the parallel cards but if I'm going to get one it's nice to get a good one. 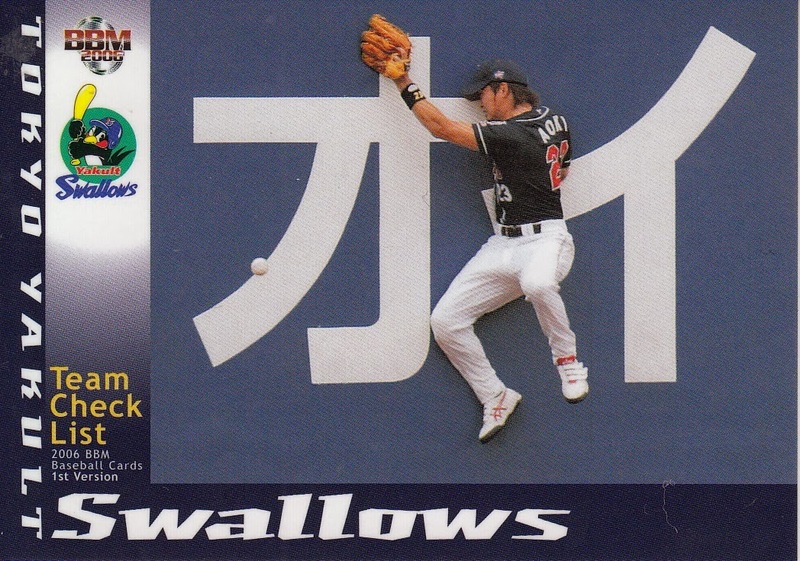 Each pack had a Masahiro Tanaka - the parallel in the first pack and the "Unrivaled Ace" card in the second. 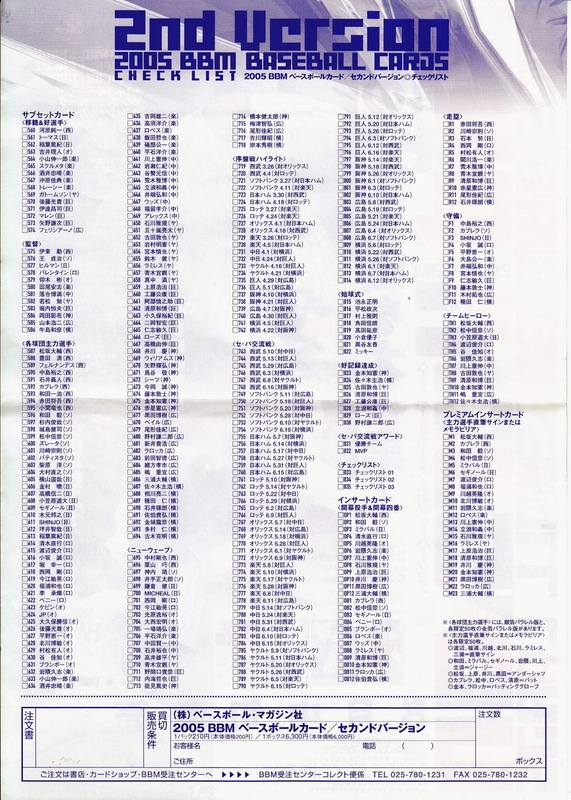 The set contained 99 cards, of which 74 were devoted to the players and manager. 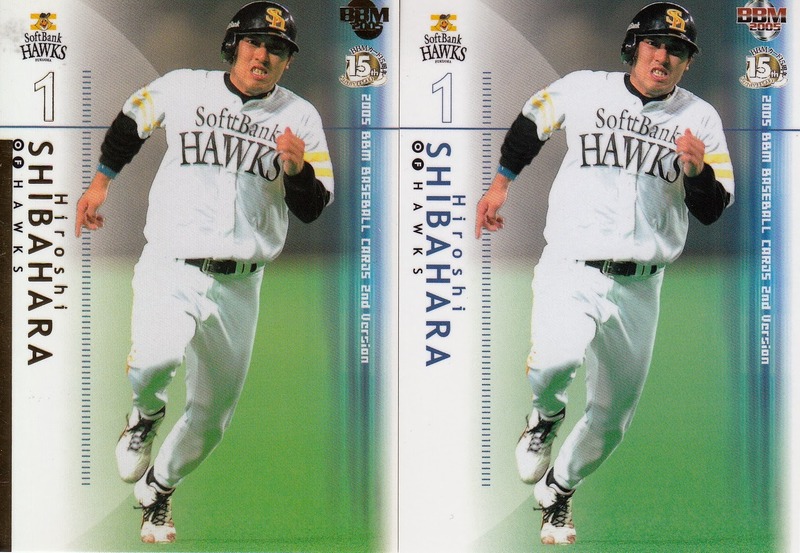 There were also three mascot cards, two leader/checklist cards, two "Star Of Hope" cards, three "Powerful Backer" cards, three "Unrivaled Ace" cards (all featuring Tanaka), three "Combination" cards and nine "Wings To Flap" cards. I was a little bummed to get two doubles out of the 14 cards but given that it's BBM, I wasn't actually surprised. I did find it odd that I only got a couple cards from the subsets. BBM released information this week on this years 1st Version set and it's going to be...different. First, the good news. The base cards look very nice although similar to last year's base cards (in the same way Topps' flagship cards this year look like last year's). They didn't drop the number of player (and manager) cards lower than the 27 it's been at since 2011 (although they are apparently continuing the stunt of having two cards for Shohei Otani - one as a pitcher and one as a batter - which is great unless it means there's only 26 Fighters represented in the set instead of 27). And after four years (which was at least two too many) they've retired the "Cross-blank" cross set subset after running out of elements (water in 2010, earth in 2011, fire in 2012 and air in 2013). Now the bad news. All the subsets that have been a staple of BBM's flagship set for years are gone. No team cards. No Best 9 cards. No Golden Glove cards. And most unbelievably, no Leader cards. Instead, there will be six(!) 12 card subsets (and you already know what 12 cards in a subset means) - Genuine Ace, Big Slugger, Limitless Hope, Spirit Of The Team, God Of Defense and Last Guardian. There will also be three 12 card insert sets - Great Hit Makers, Wonder Rookie and Lightning. There will be parallels of 108 of the player cards, as well as all the rookie cards, all the subset cards and the Great Hit Makers and Wonder Rookie inserts. The Lightning inserts are limited to 50 cards each - I assume they are serially numbered but I don't know that for sure. There will also be memorabilia cards available - jersey and autograph cards. I'm very disappointed that BBM isn't doing the Leader cards. 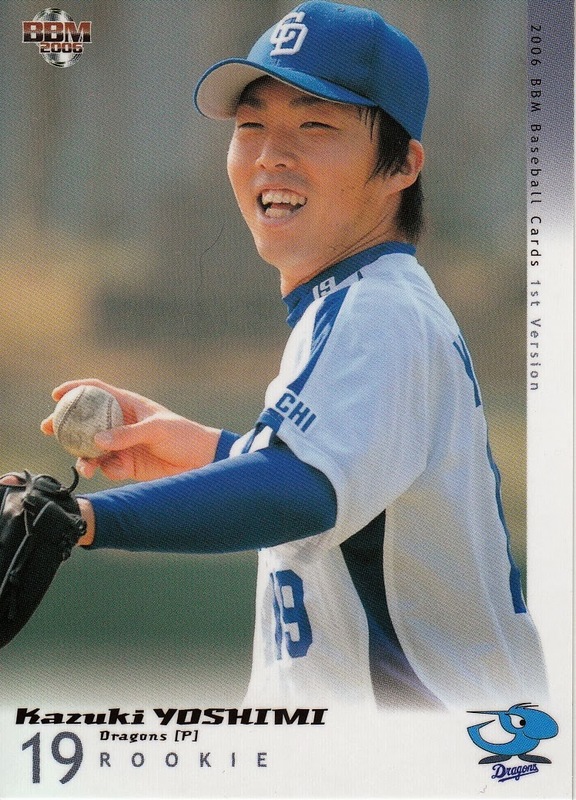 Masahiro Tanaka should have had several cards in the subset - MVP, Sawamura and various statistical categories. And I was looking forward to a Wladimir Balentien 60 home run card. 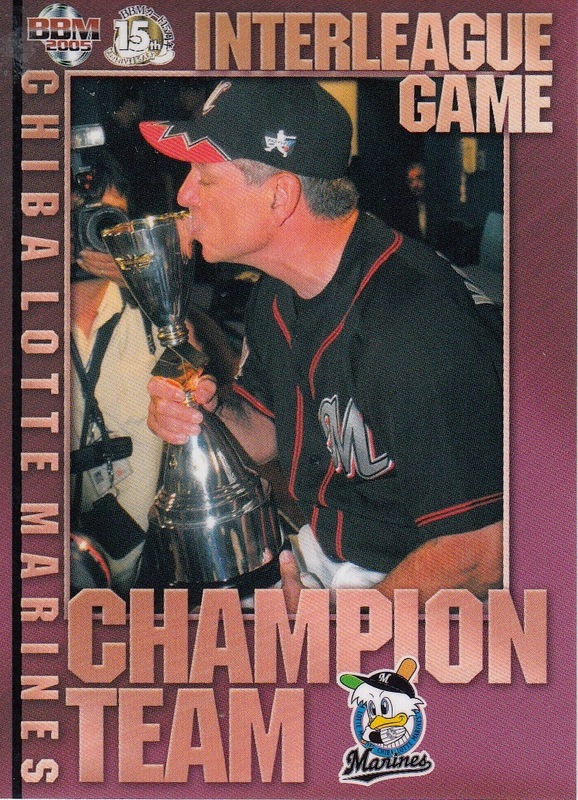 And BBM is really saying "f*ck you" to Eagles fans - not only do the Eagles not get a Nippon Series set last fall, they don't even get a "Nippon Series Champion" card in the 1st Version set. The set will be out in mid-April. 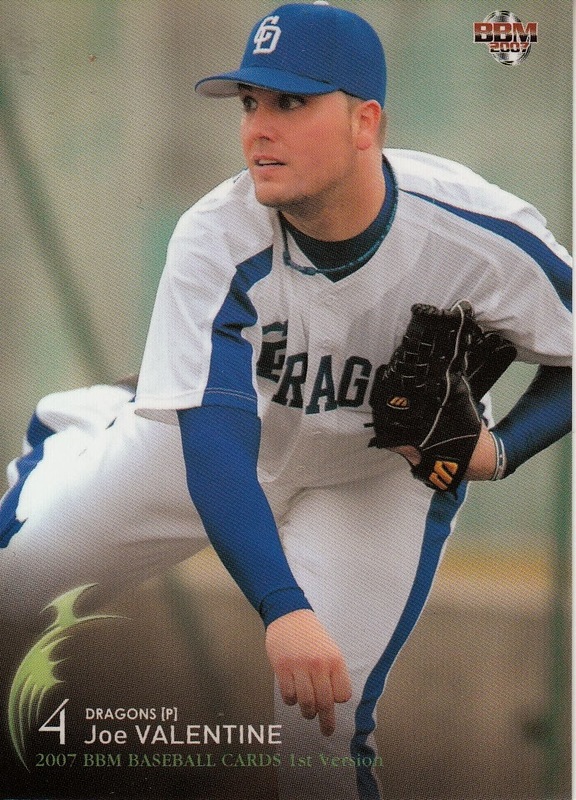 In honor of last Friday being Valentine's Day, I thought I'd share a card of...no, not him, but instead former Cincinnati Reds pitcher Joe Valentine, who in 2007 was a Chunichi Dragon just long enough to make it into BBM's 1st Version set (#218). He only pitched for the ni-gun Dragons before getting released in June of that year. 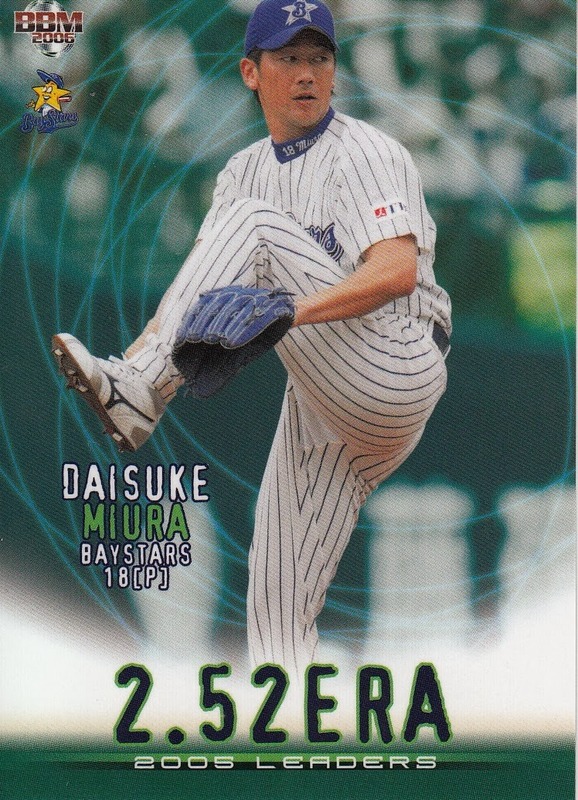 He finished the season back in the US playing for the Long Island Ducks of the Atlantic League (where one of his teammates was former Orix Blue Wave pitcher Ed Yarnell). 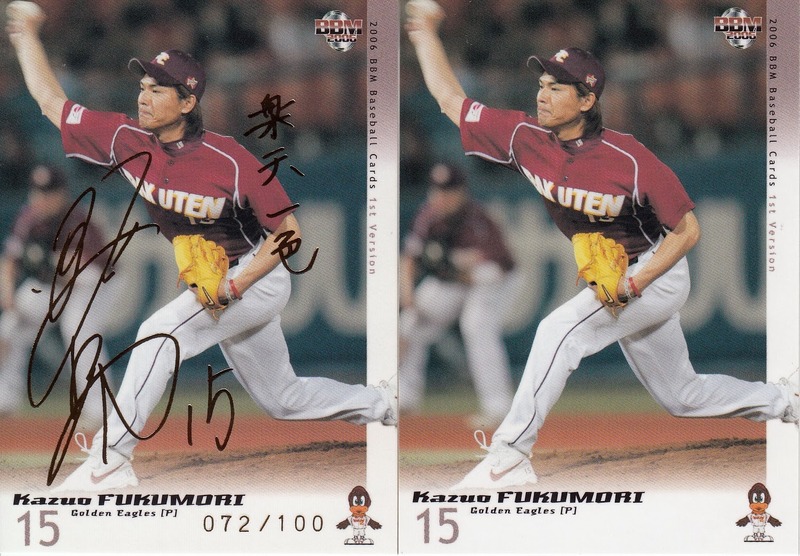 Memorabilia Cards: Jersey cards for Toshiya Sugiuchi, Toshiaki Imae and Daisuke Miura. 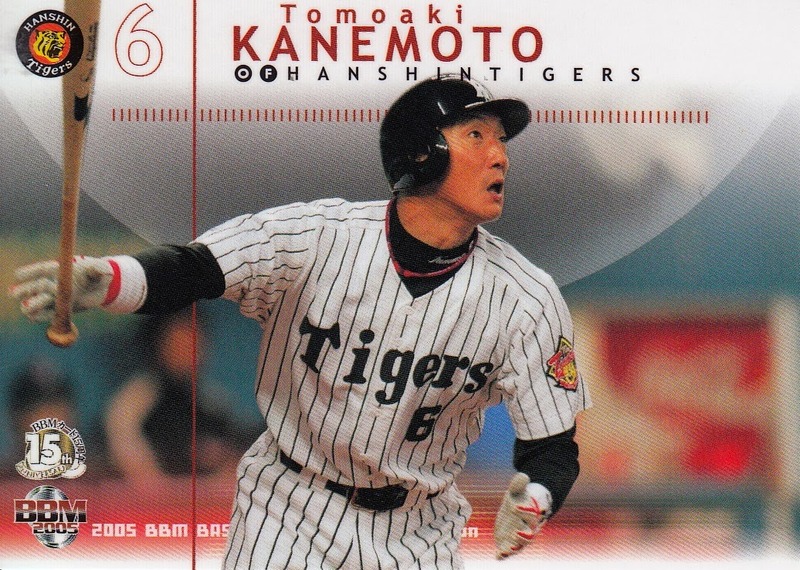 Tomoaki Kanemoto bat card. 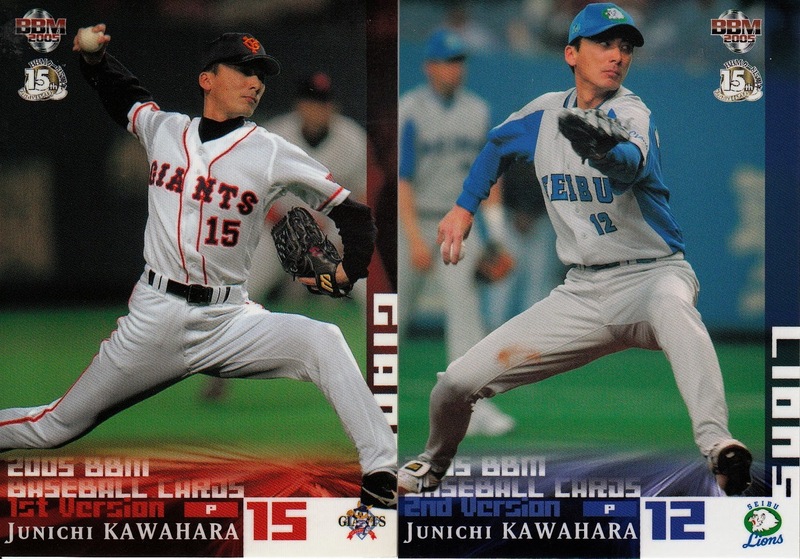 Dual jersey cards for Sugiuchi & Miura and Imae & Kanemoto. Parallels: 108 cards have silver facsimile autographs. There is also a gold facsimile autographed version of those 108 cards that is serially numbered to 100. 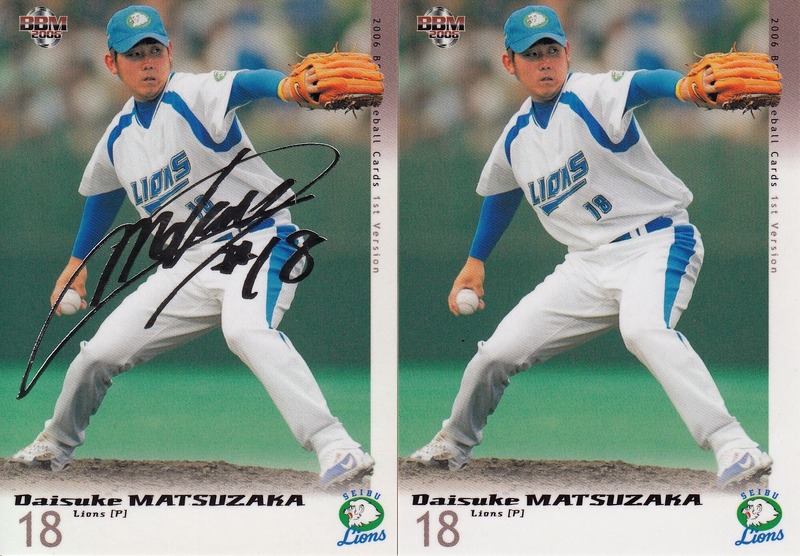 Autographed Versions of Retirement Players (except Koji Gotoh and Daisuke Motoki) and Legend Players subsets (numbered to 50). Gold and "Blue Hologram" parallels for both the Best 9 and Golden Glove insert sets - the "Blue Hologram" parallels are serially numbered to 100. After growing the 1st Version set back to the pre-2002 "flagship" set sizes in 2005, for 2006 BBM dialed the size of the 1st Version set back down a little. The 2006 set had 501 cards in it, almost 60 cards down from the 2005 set. The drop in set size is pretty much completely attributable to the drop in the number of players depicted - the 2005 set had 40 players per team (480 player cards in all) while the 2006 set had just 35 (420). 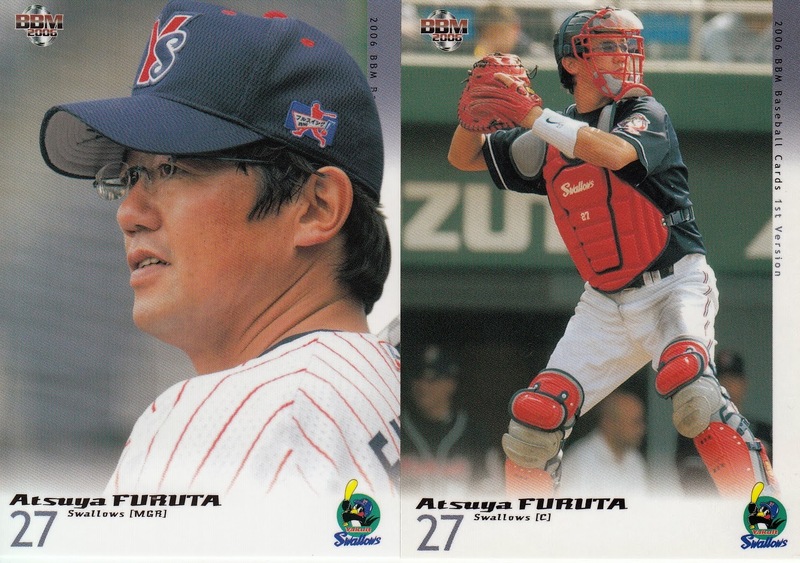 Atsuya Furuta of the Swallows had been named player-manager and so had both a player and a manager card. Once again, 108 of the player cards (9 per team) had two varieties of parallel facsimile autograph cards - gold (numbered to 100) and silver. Besides the annual Leader subset, the only subsets in this set are the Retired Player subset containing cards of player who retired at the end of the previous season and the Legend Player subset featuring cards of managers who left their positions (either voluntarily or otherwise) following the 2005 season. 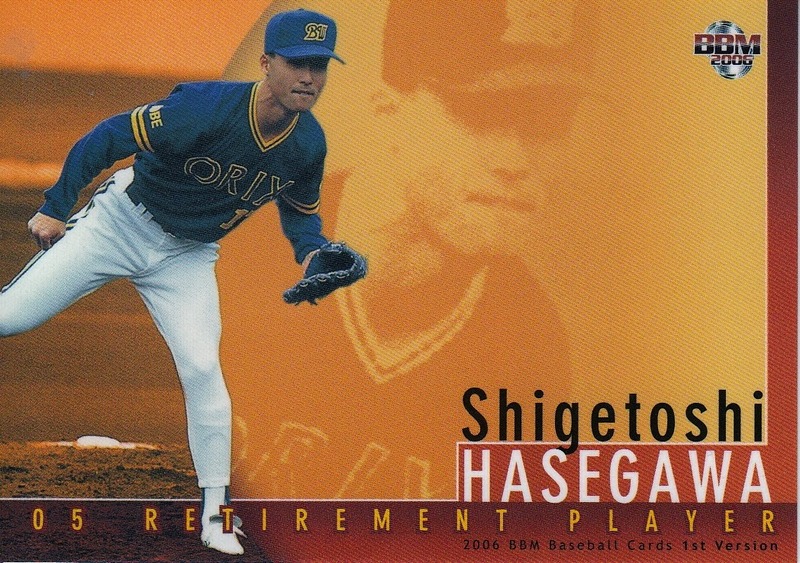 One Retired Player who stands out is Shigetoshi Hasegawa who had been playing in MLB for the Angels and Mariners since 1997. I believe at this time he is the only player to retire as an MLB player to appear in one of BBM's subsets or sets for retiring players. 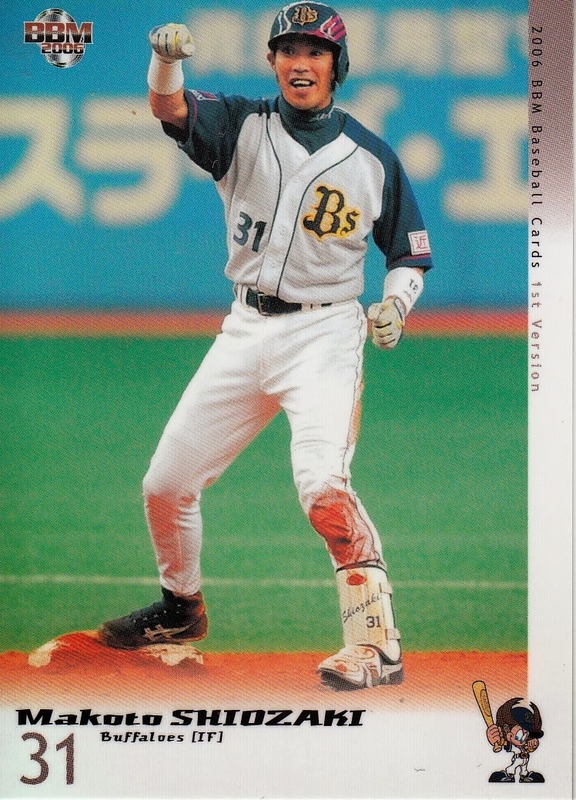 Kazuhiro Sasaki also appears in this particular subset, but he had played in NPB the previous two seasons. The other 18 players in the subset are Koji Gotoh, Kiyoshi Hatsushiba, Tsutomu Iwamoto, Takashi Kashiwada, Tetsuru Kawajiri, Makoto Kitoh, Kanei Kobayashi, Daisuke Motoki, Takeshi Nakamura, Shinji Nishiyama, Kenjiro Nomura, Koichi Ohshima, Toshikazu Sawazaki, Masanori Taguchi, Taisei Takagi, Hiroshi Takamura, Kenichi Watanabe and Tatsuki Yamamoto. 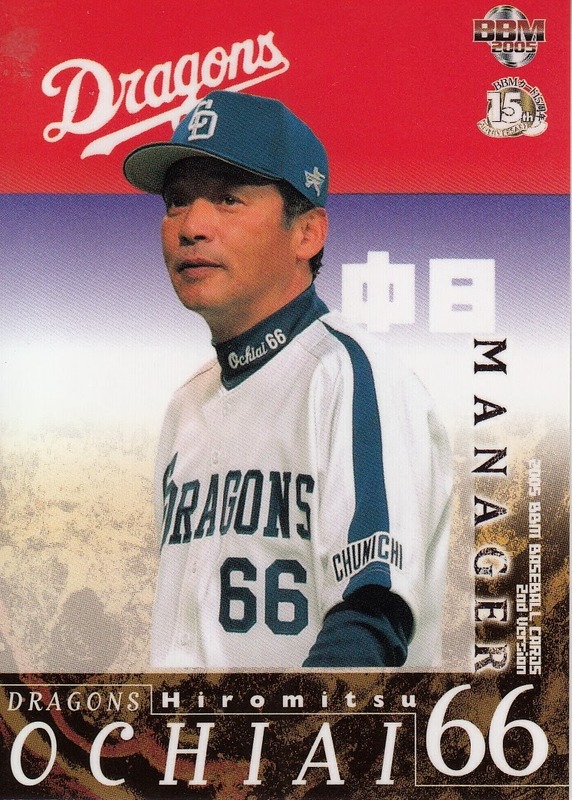 The four former managers (Legend Players) are Tsuneo Horiuchi, Yasushi Tao, Tsutomu Wakamatsu and Koji Yamamoto. 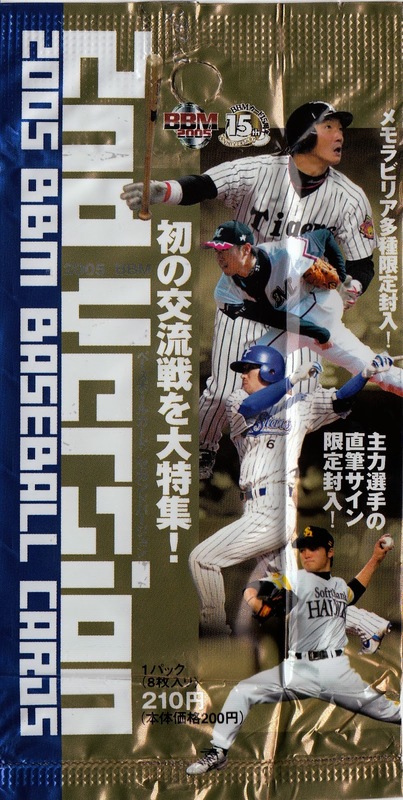 They're all depicted as managing the team they were left go from (the Giants, Eagles, Swallows and Carp respectively) rather than from their playing days like all the previous Legend Player subsets. 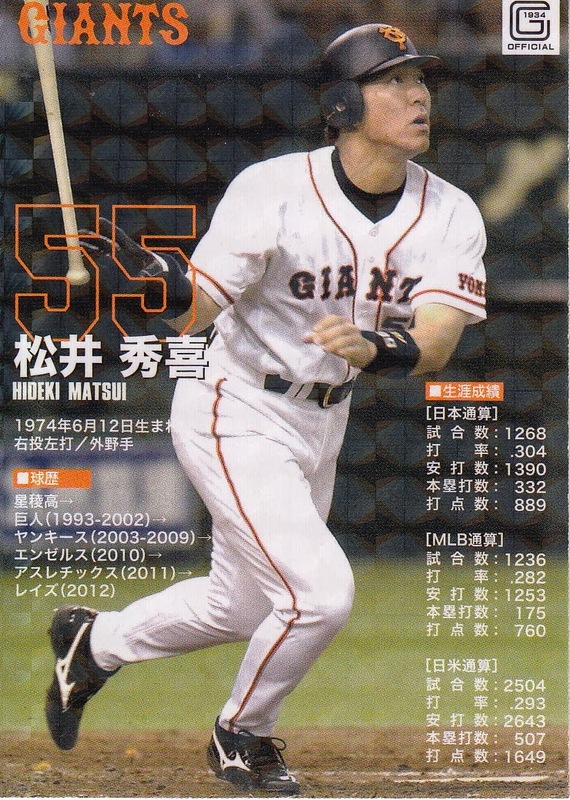 There are serially numbered (to 50) autographed versions of all the Retirement Player and Legend player cards except for Gotoh and Motoki for some reason. Regular packs for the set contained the two now-standard insert sets for the previous season's Best 9 and Golden Glove teams. There were gold parallel versions of both inserts also along with a serially numbered (to 100) "blue hologram" version. Engel does not list any special "Light" pack cards associated with this set - no "kira" cards, not MVP inserts. I do not know if this is simply an oversight on his part of if BBM either did not issue "Light" packs for this set or didn't issue special cards with them. 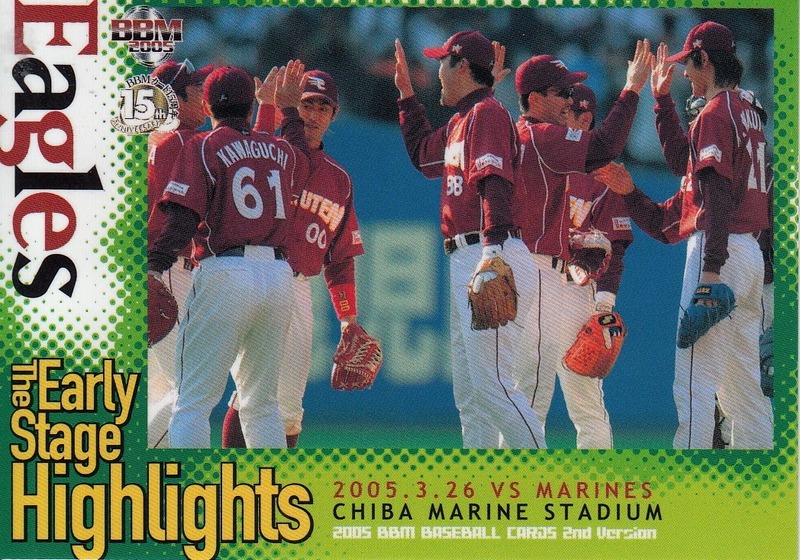 Engel does list "Light" pack cards for the 2006 2nd Version set so I'm inclined to believe that BBM didn't issue them for this set. Parallels: Silver and gold parallel versions of the 108 player cards - gold parallels are serially numbered to 50. Kira versions of New Wave subset (Light packs only). 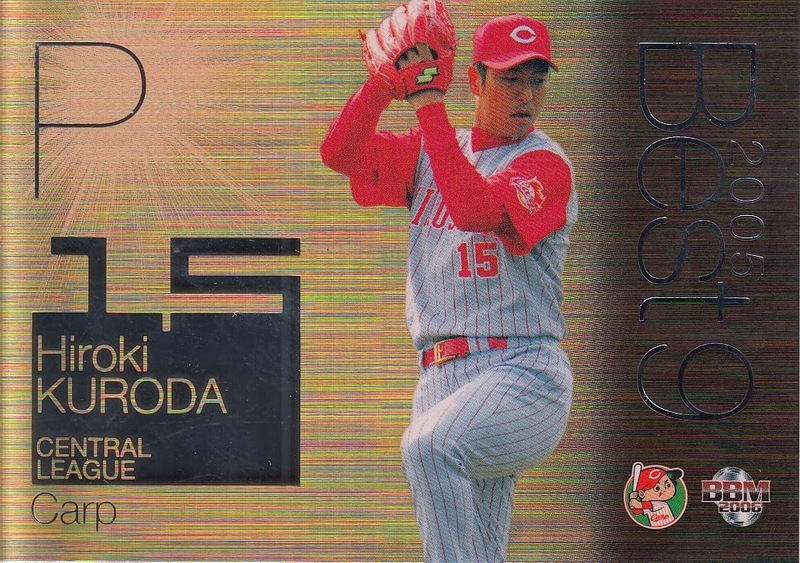 Light packs also had Kira parallels of Opening Game Pitchers, Opening Game Hitters and Team Hero inserts. 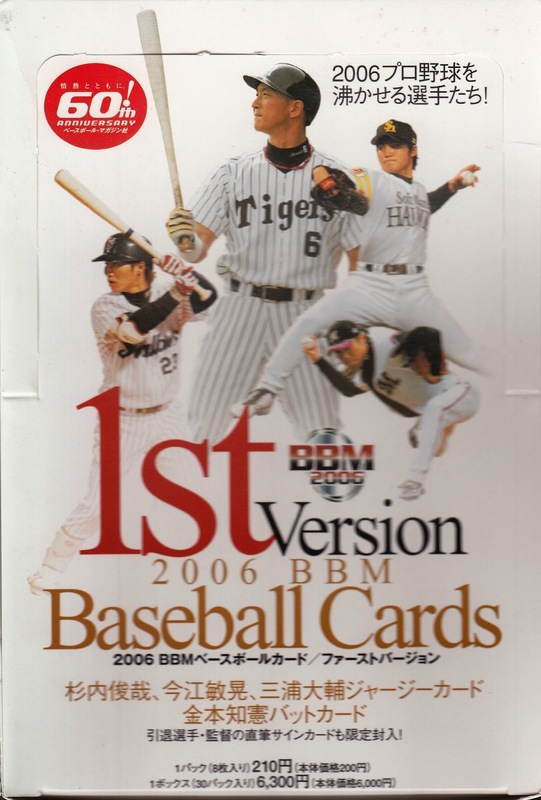 In 2005 BBM followed up the largest 1st Version set so far (559 cards) with the smallest 2nd Version set so far (276 cards). 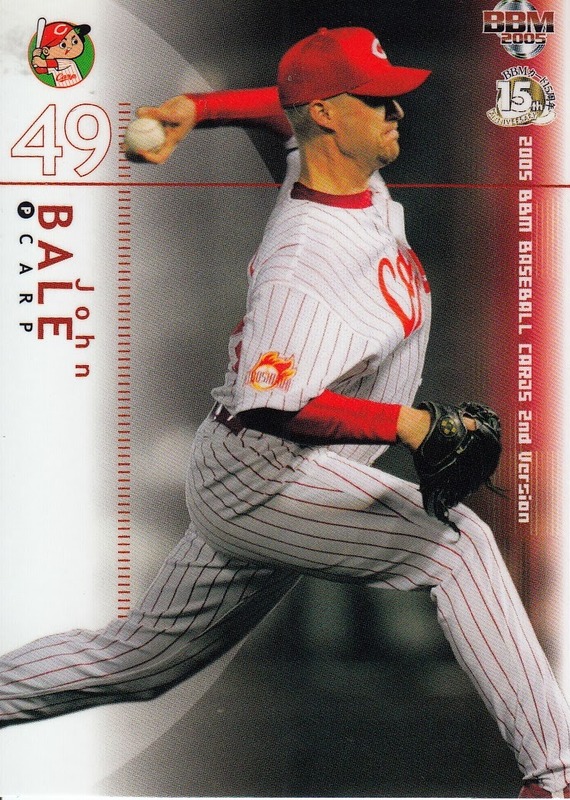 The total number of cards between the two sets (835) was in line with the total sizes of the 2002-2004 sets however (2002 had 867 cards, 2003 had 839 cards and , 2004 had 852 cards). This set featured only 108 "regular" player cards (9 per team), by far the smallest number in any BBM flagship set. These cards represented less than 40% of the total cards in the set. 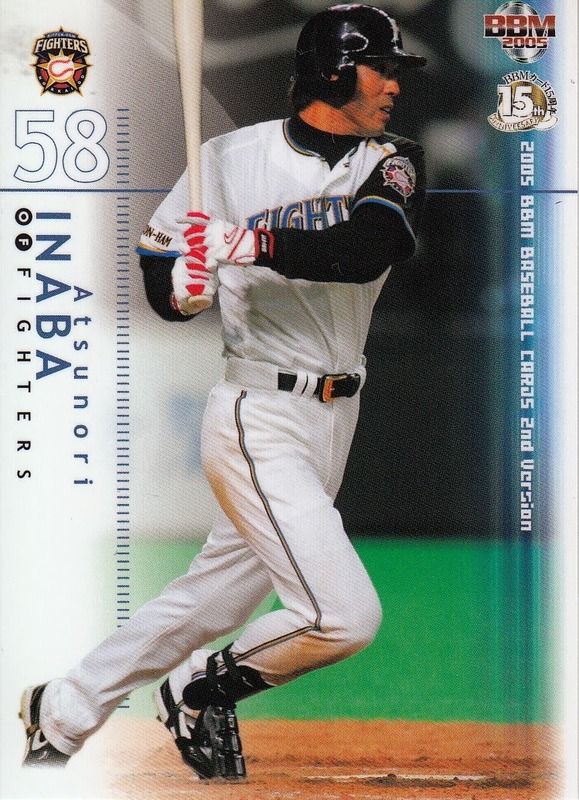 Surprisingly, there were four players who had "regular" cards in 2nd Version who did not appear in the 1st Version set - Atsunori Inaba of the Fighters, Shinichiro Koyama and Tadaharu Sakai of the Eagles and Masanobu Ohkubo of the Buffaloes. 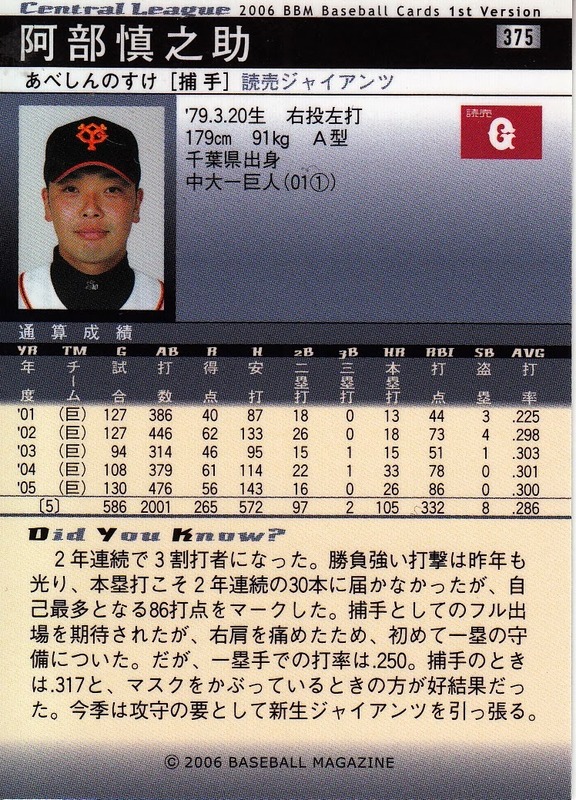 The backs of the cards were a bit unusual as they did not show the player's complete statistical record. For the first time, the backs only contained the player's stat lines for 2004 and for his career. 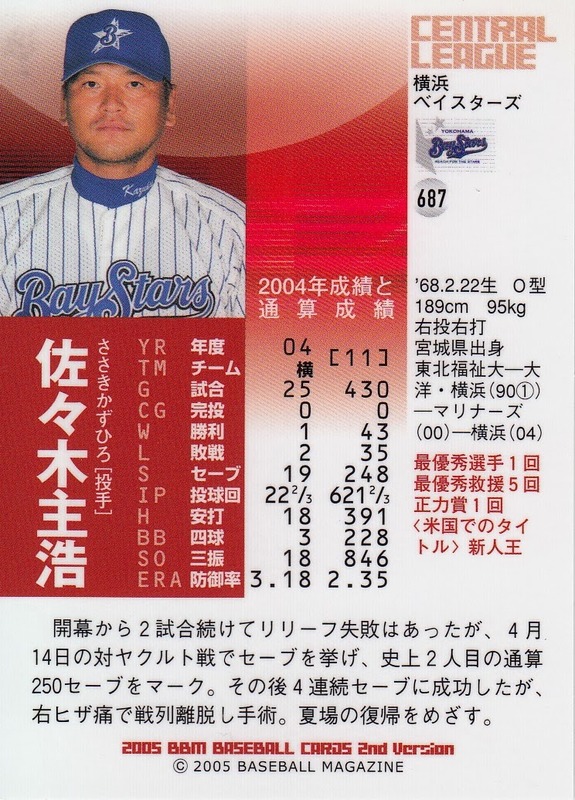 In the case of new foreign players, the back simply read "New Comer 2005" and had no stats at all. Instead of signature parallels, this time BBM did cards which had a strip on one side in either silver or gold. The player's name and number would also be written in silver or gold along with the BBM logo. The gold cards were serially numbered to 50 - the number appears on the back instead of the front. I think that there is a parallel version of all 108 player cards. There are, however, no "kira" versions of the regular player cards in the "Light" packs. In addition to the "regular" cards, BBM also included a 15 card "1st Version Update" subset. 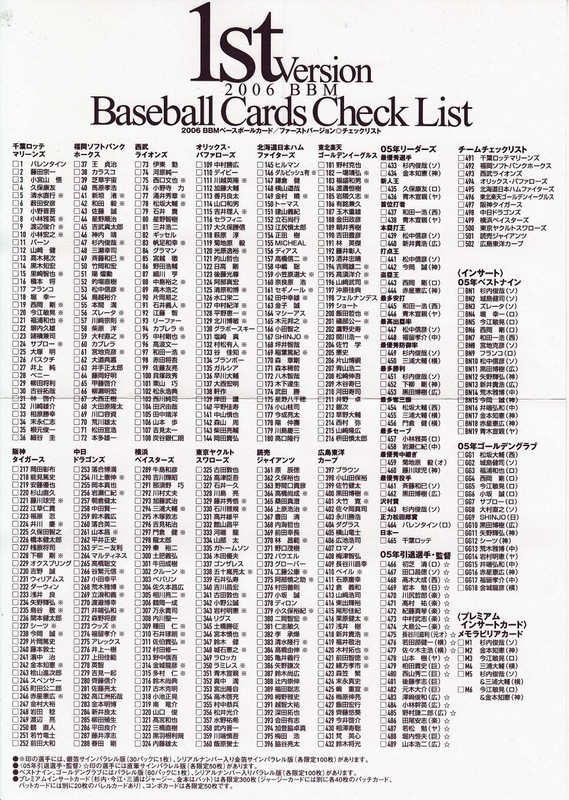 These 15 cards used a design identical to the "regular" 1st Version cards with the exception that the cards are actually labelled "2nd Version". The majority of the players in the subset were late signing players although a couple were traded. Only two of them (Junichi Kawahara and Mitsutaka Gotoh) appeared in the 1st Version set. 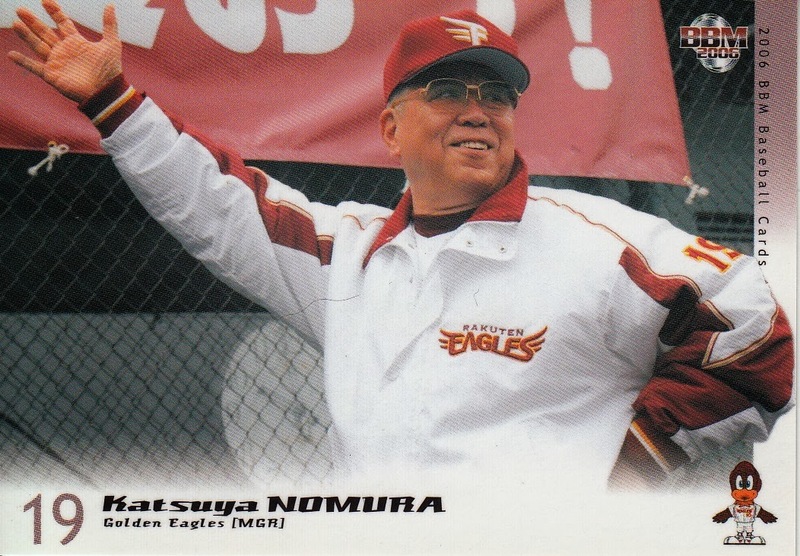 There were five Eagles (Shinichiro Koyama, Yoshinori Okihara, Tadaharu Sakai, Matt Skrmetta and Andy Tracy), four Giants (Masashi Date, Gotoh, Scott Mullen, and Kenji Yano), two Fighters (Atsunori Inaba and Brad Thomas), and one player each for the Carp (Juan Feliciano), Lions (Kawahara) and Swallows (Rick Guttormson). And yes, you read that right - Inaba, Koyama and Sakai appear in both the 1st Version update and the "regular" player cards. Normally BBM includes the managers with the "regular" cards in the set - i.e the managers have a card that uses the same design as the players. For the first and so far only time ever, BBM did a separate design for the managers. 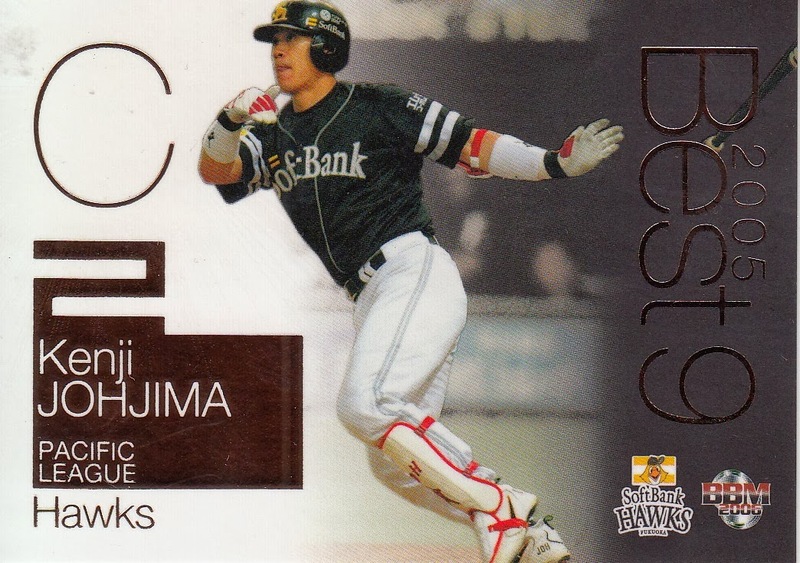 As standard for a 2nd Version set, this set included a subset devoted to prospects. 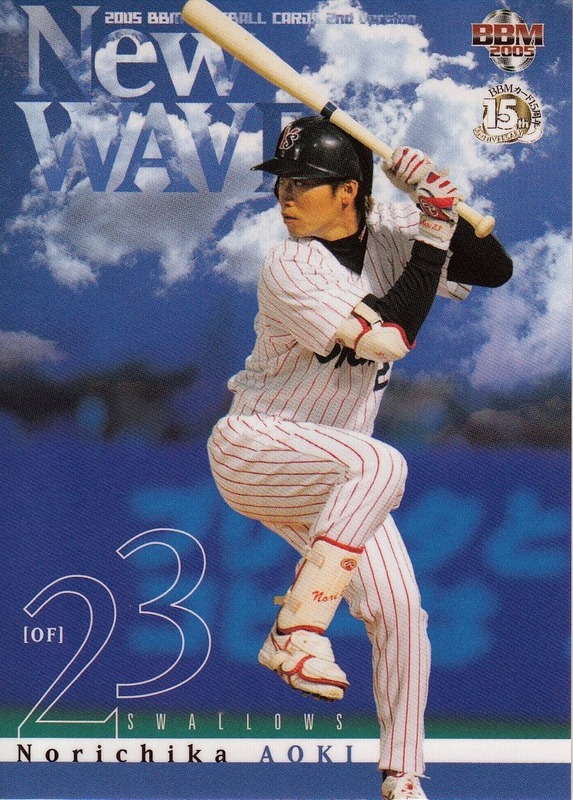 Called "New Wave" again (for the first time since 2003), the subset contained 24 cards and as you probably already guessed, that meant there were two players per team. 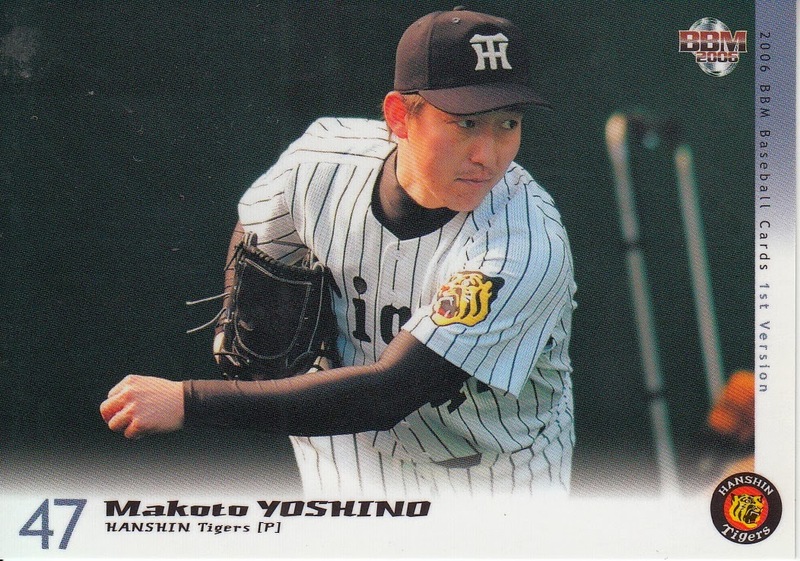 The players included were Norichika Aoki, Kantaro Hashimoto, Yosuke Hiraishi, Yasuhiro Ichiba, Shotaro Ide, Toshiaki Imae, Yuya Ishii, Ken Kamakura, Yasushi Kamiuchi, Hideki Kishimoto, Takumi Kuriyama, Atsuhiro Mitsuhara, Michael Nakamura, Takeya Nakamura, Kenichi Nakata, Tsuyoshi Nishioka, Atsushi Nohmi, Takahiko Nomaguchi, Yoshinori Ogata, Hiroaki Ohnishi, Yuhei Takai, Tomohiro Umetsu, Tetsuya Utsumi, and Teruaki Yoshikawa. "Kira' parallel versions of these cards were available in "Light" packs. 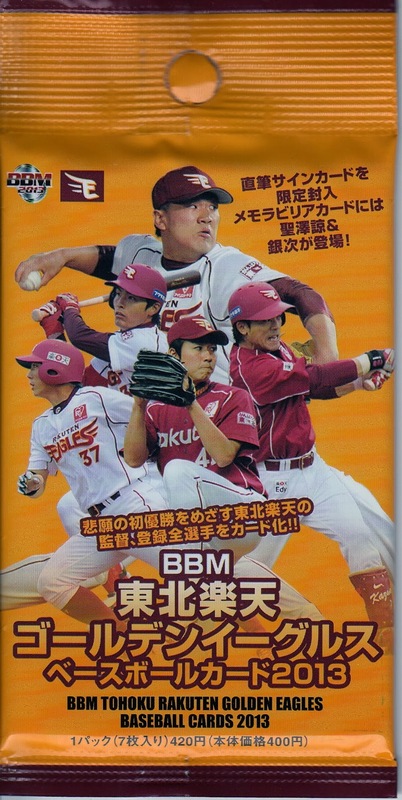 BBM included two subsets that commemorated events early in the 2005 season. The first was called "The Early Stage Highlights" and contained 24 cards (two per team). These cards celebrate note-worthy games in March and April. For example, one of the Eagles cards immortalizes their first game ever. 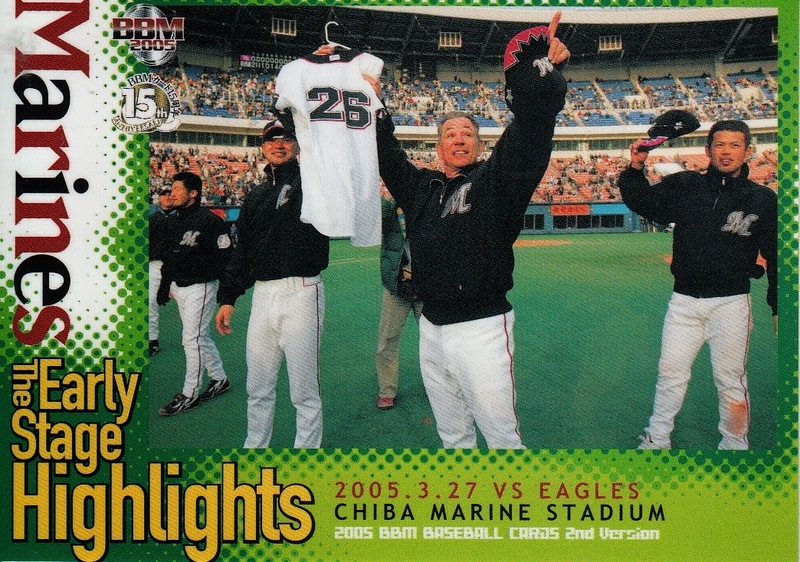 One of the Marines cards celebrates their 26-0 drubbing of the Eagles in the Eagles second game ever. Many of the cards depict groups of players and players are not individually labeled, at least not on the front of the card. 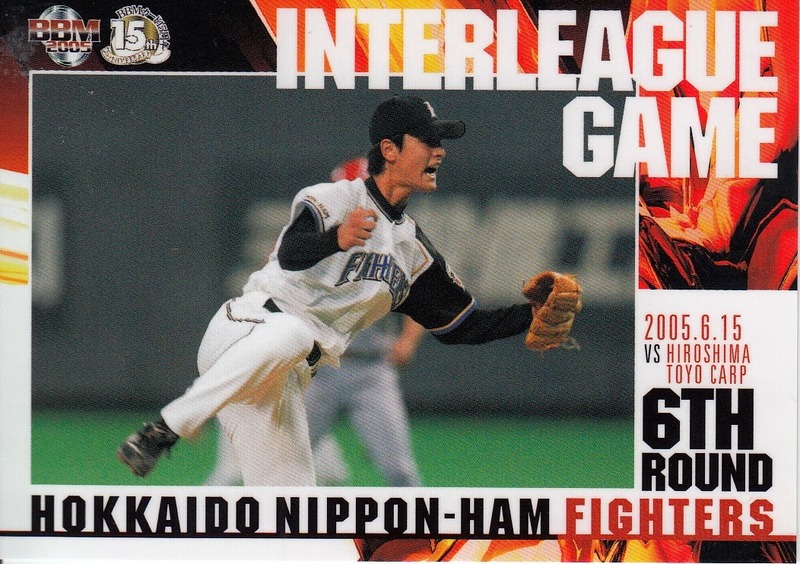 NPB introduced inter-league play in 2005 and BBM included a 72 card subset called "Interleague Game" to acknowledge it. There are six cards for each team that each highlight one of that team's games against one of the teams from the other league. Like the "Early Stage" cards, many of the cards show groups of players and players are not individually identified. 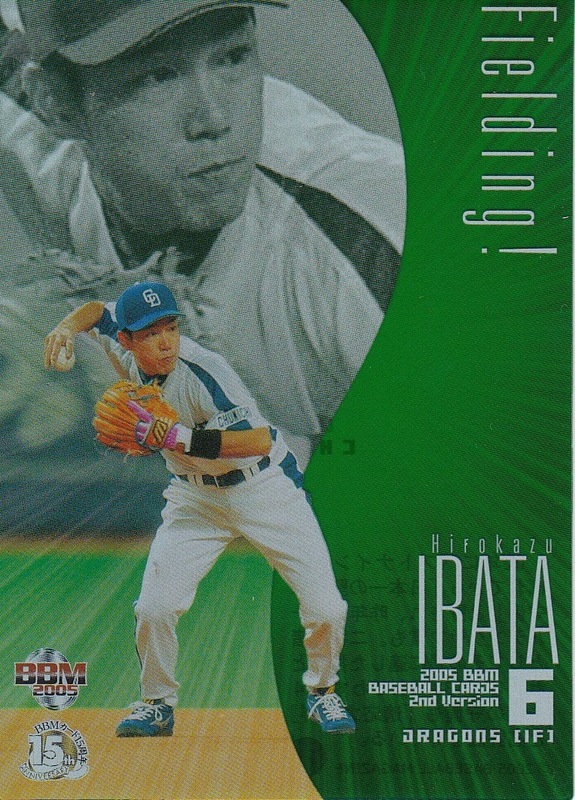 I frequently see one of the Fighters cards from this subset listed as a Yu Darvish card from this set. I'm probably splitting hairs when I say that I disagree - it's kind of like saying that Topps did a card of Thurman Munson in their 1980 set because he's visible in the Yankees team picture. 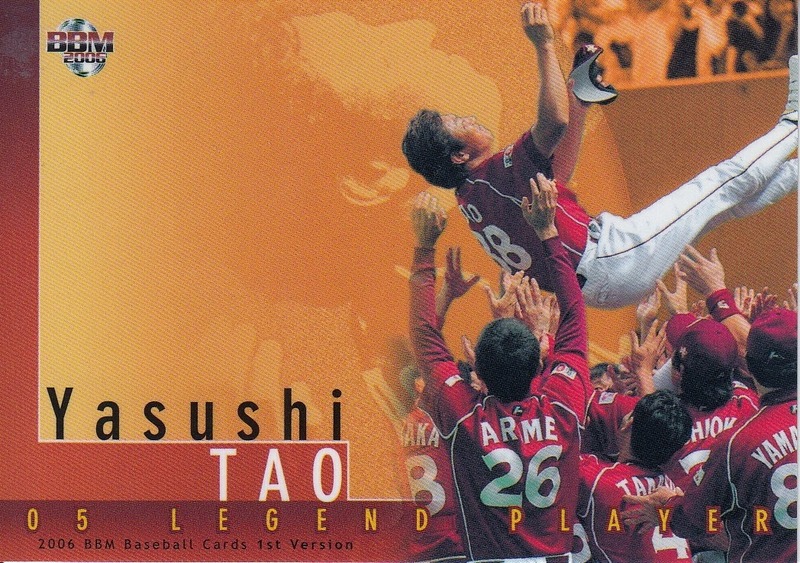 Although in this case at least Darvish is the only player pictured on this card. 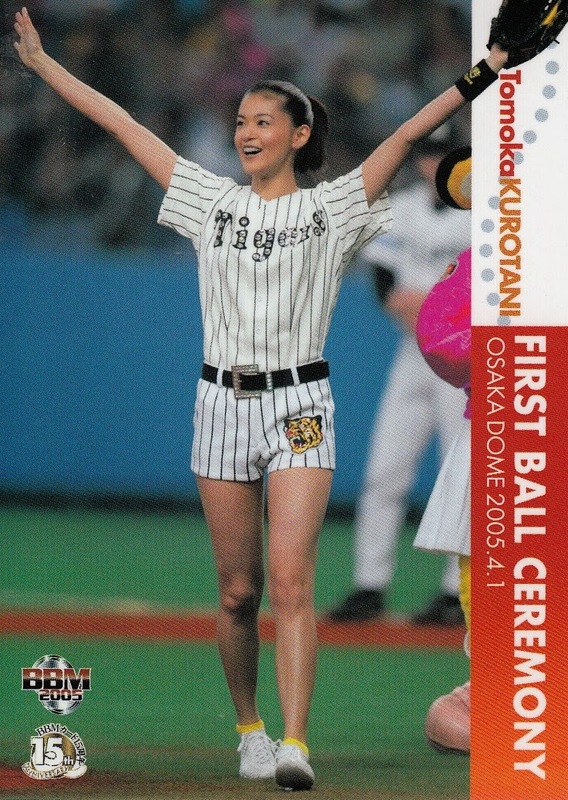 The "Ceremonial First Pitch" subset from the 2004 2nd Version set returned this year as a subset called "First Ball Ceremony". It doubled in size to eight cards this year. 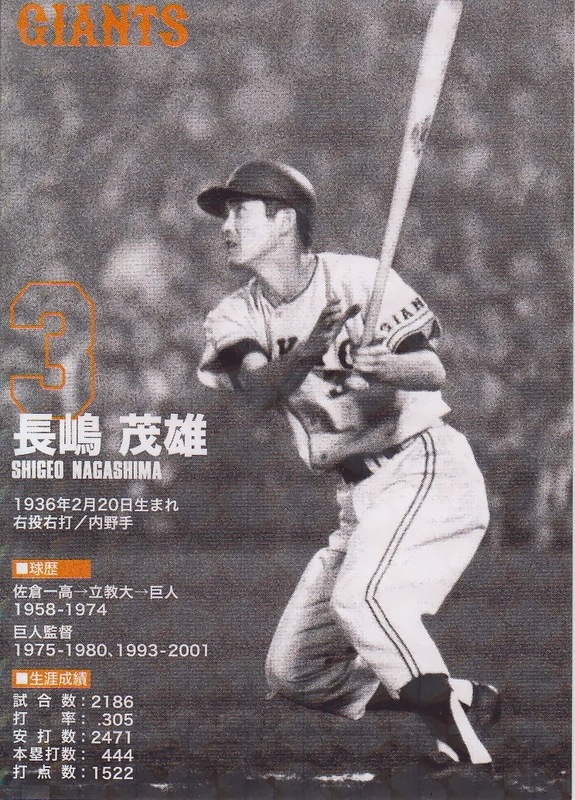 Three of the cards featured former players - Masaaki Ikenaga, Masaji Hiramatsu and Masanori Murakami. Ikenaga's inclusion is noteworthy as he had been banned for life in 1970 due to his involvement in the Black Mist scandal. He was reinstated in 2005 after a long appeal process. 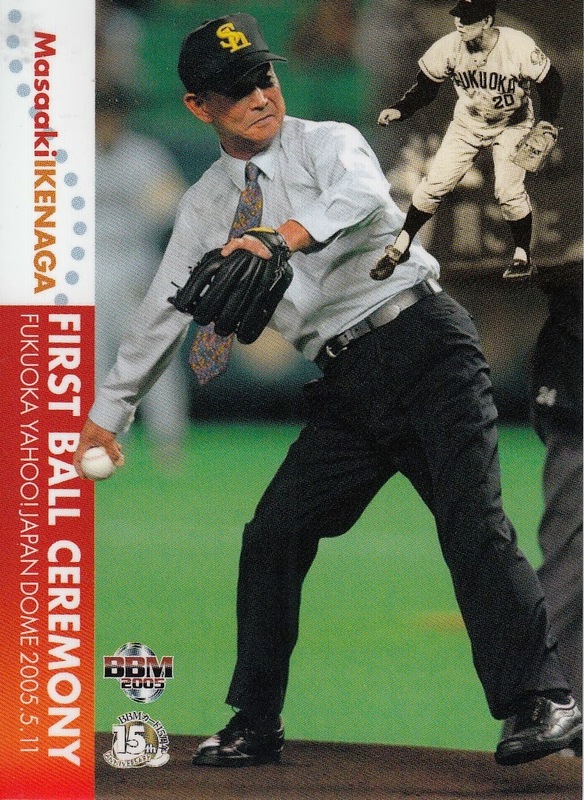 Another card featured Mickey, the ball delivery dog for the Hiroshima Toyo Carp. The other cards were for celebrities - "Seidokaikan Karateka" Nobuaki Kakuda, mixed martial arts fighter and wrestler Nobuhiko Takada, gravure idol and model Yuko Ogura and actress Tomoka Kurotani. 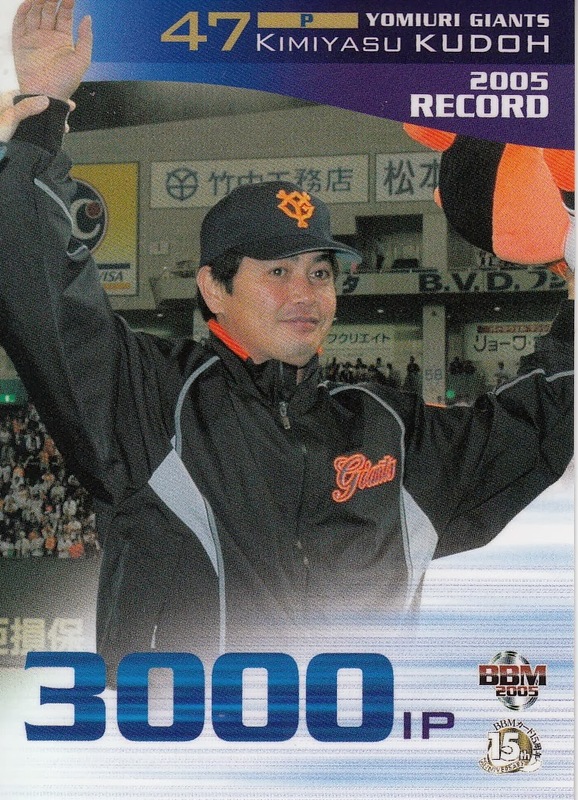 The "2005 Record" subset is somewhat mis-titled as the events commemorated by the cards are milestones reached by players and not new records. 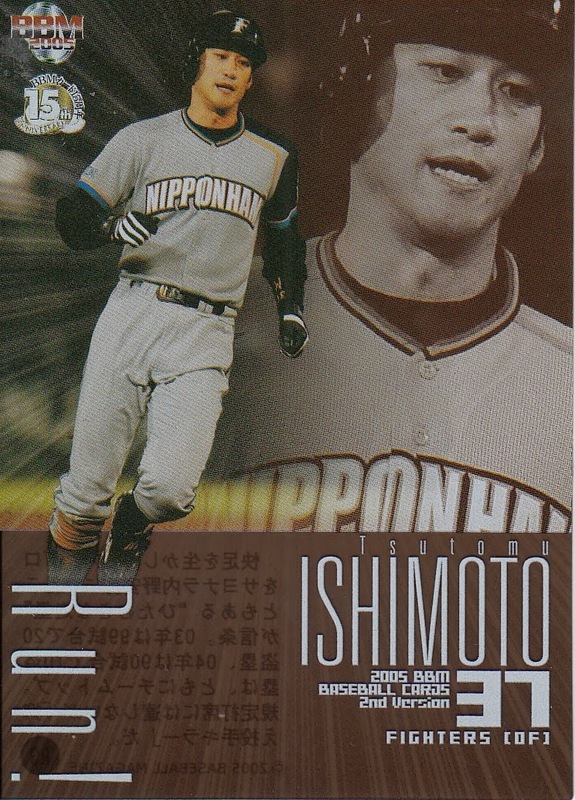 The eight players included are Atsuya Furuta (2000 hits), Tomoaki Kanemoto (300 home runs), Kazuhiro Kiyohara (500 home runs), Kimiyasu Kudoh (3000 innings pitched), Kenjiro Nomura (2000 hits), Tuffy Rhodes (350 home runs), Kazuhiro Sasaki (250 saves) and Kazuyoshi Tatsunami (450 doubles), All the milestones were reached between April and June of 2005. 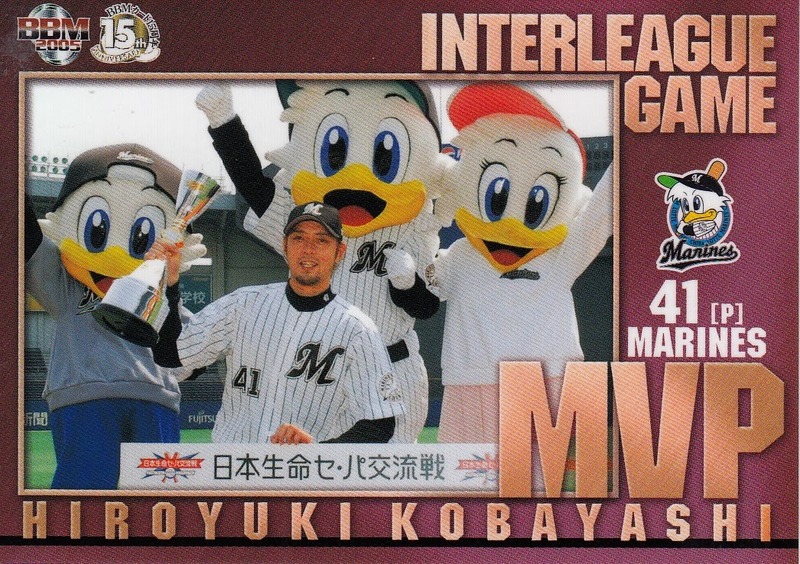 The final subset in the base set contained two cards celebrating the interleague champion (the Marines) and MVP (Hiroyuki Kobayashi). 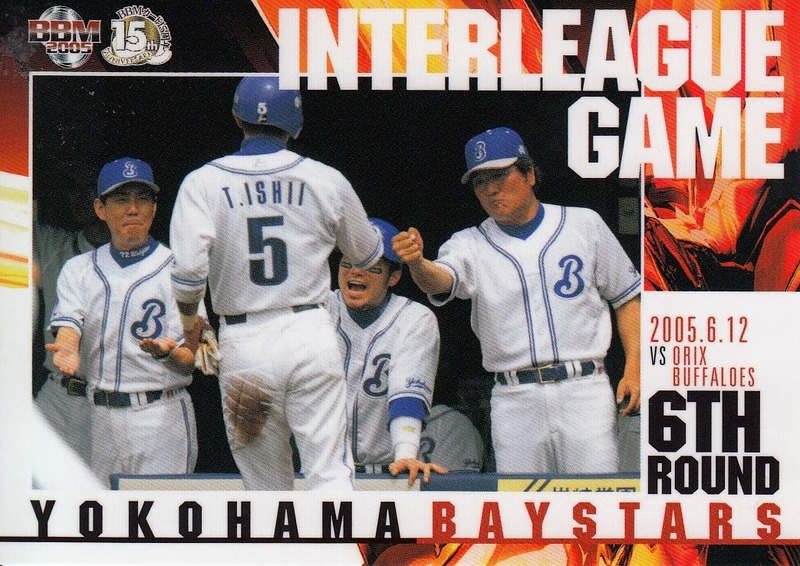 These are also labelled "Interleague Game" but I feel they are a separate subset in that the design is a little bit different and these two cards are not numbered consecutively with the others (the others are numbers 743 to 814 while these are cards 831 and 832). 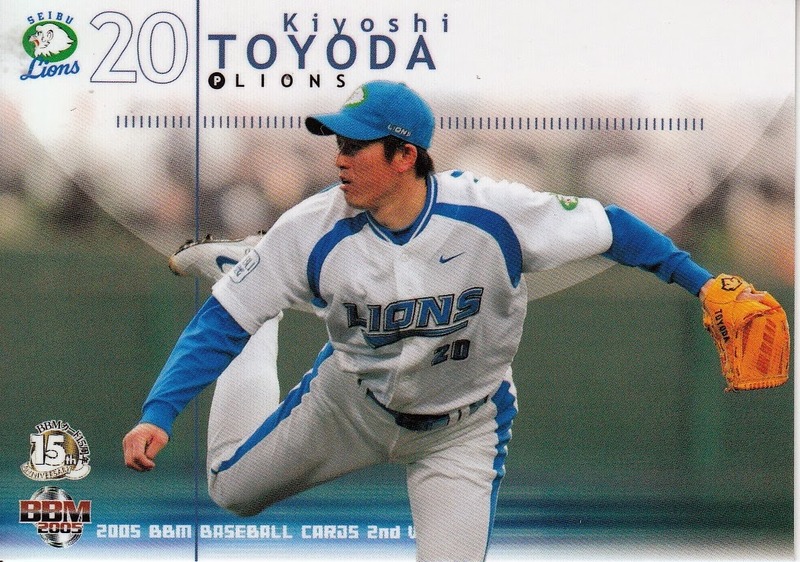 And the card of Kobayashi is clearly labelled as a card of his, unlike the Darvish one above. Depending on how you classify them, there were either three or five insert sets issued with the set (or even four if you're half agreeing with me and half agreeing with Gary Engel). Engel lumps the "Run!" and "Fielding!" cards together as one set while I view them as two separate ones (as they have two separate sets of numbers). Both sets contain 12 cards (one for each team) and are made of translucent plastic. 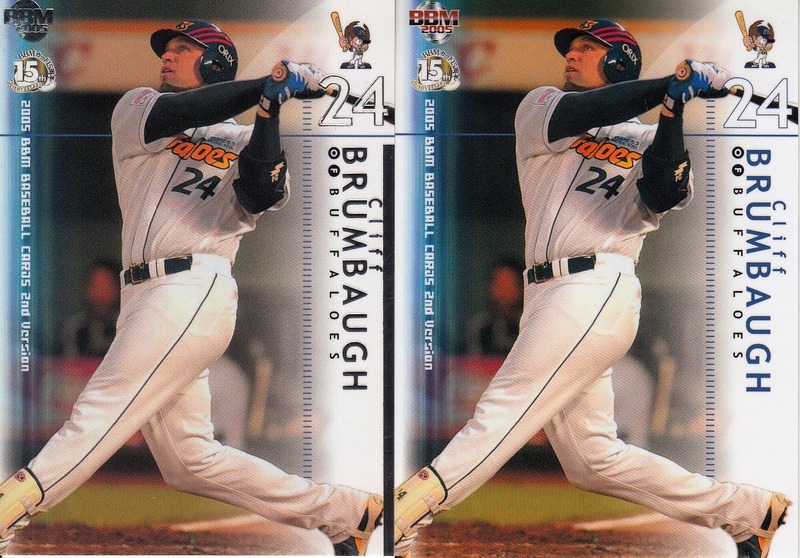 Similarly, Engel lumps the "Opening Game Pitcher" and "Opening Game Batter" cards into one insert set while I think they are two separate ones (again because they are numbered separately). 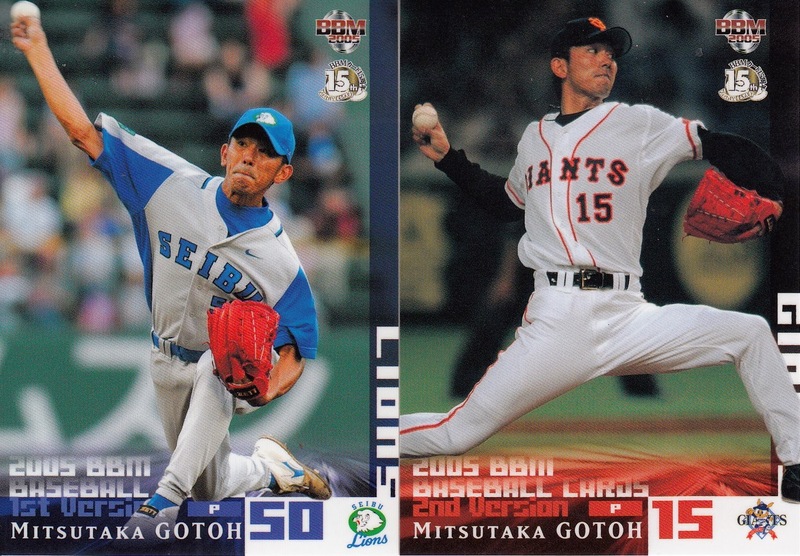 Both sets again contain 12 cards featuring the starting pitcher and cleanup batter for each team's Opening Day lineup. There were parallel "kira" versions of these available in the "Light" packs. 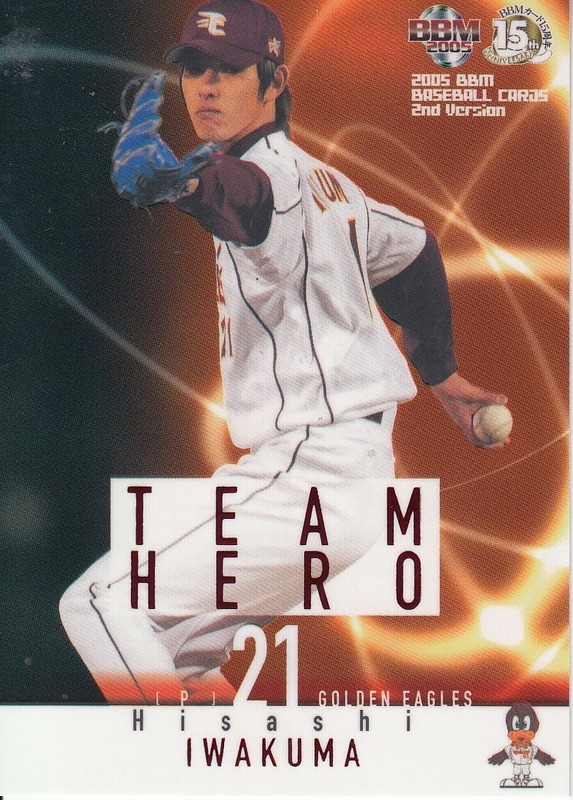 The other insert set (which Engel and I do not disagree on) is the "Team Hero" set. Once again, this set contained 12 cards (one for each team) and there was a "kira" parallel version available in the "Light" packs. There were 23 separate memorabilia cards available with this set. There were only 50 of each card made although I do not know if the cards were serially numbered or not. 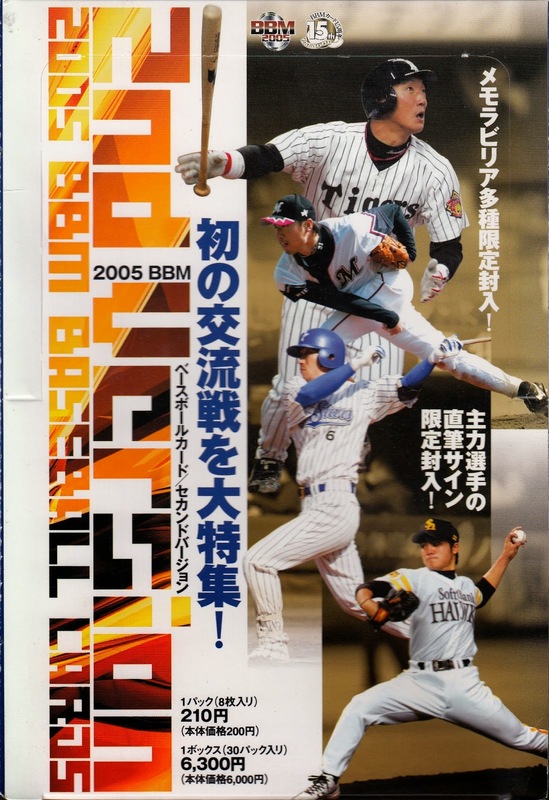 There were several different types of memorabilia available - undershirts (Daisuke Matsuzaka, Kei Igawa, Koji Uehara and Hiroki Kuroda), bats (Alex Cabrera, Nobuhiko Matsunaka, Luis Lopez and Kazuhiro Kiyohara), jerseys (Tsuyoshi Wada, Carlos Mirabal, Fernando Seguignol, Hisashi Iwakuma, Kenshin Kawakami and Kazuyoshi Tatsunami), batting gloves (Tomoaki Kanemoto and Greq Larocca) and autographs (Shunsuke Watanabe, Kazuya Furuuka, Hidetaka Kawagoe, Hirotoshi Kitagawa, Masanori Ishikawa, Alex Ramirex and Daisuke Miura). I want to add one final word here on the "Light" packs. I have never seen a "Light" pack from this set but I'm guessing from what I'm reading that each pack contained four cards - three "regular" cards and one "kira" parallel card - either for the "New Wave" subset or for the "Opening Game" or "Team Hero" insert sets. I think (but again I don't know for sure) that three "regular" cards could only be from the 108 player cards, not from any of the subsets. 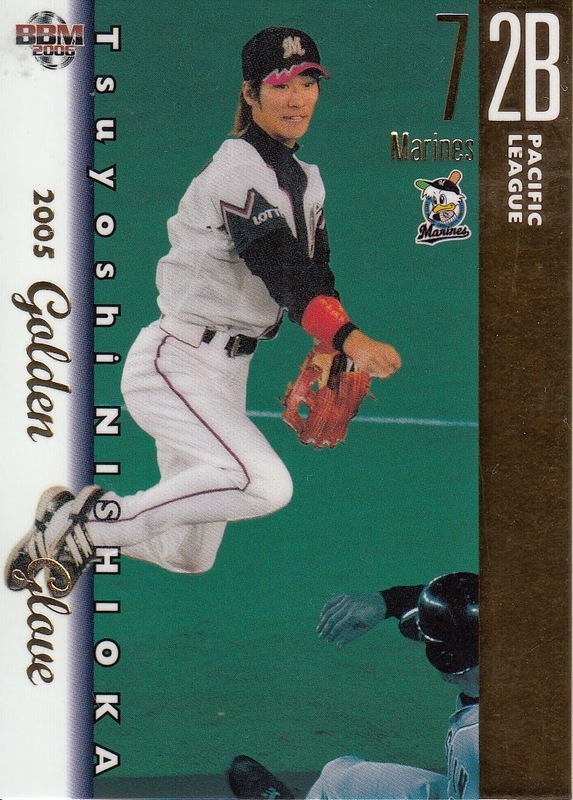 As usual, memorabilia cards were not available in the "Light" packs but in a departure from the previous years (as well as the 2005 1st Version set) there were no MVP inserts that were exclusive to the "Light" packs.